The estimation of effect size in clinical trials commonly disregards recurrent outcomes. We investigated the effectiveness of a complex intervention on recurrent outcomes in patients with type 2 diabetes. In the Diabetes Care in General Practice (DCGP) randomised controlled trial, 1,381 patients newly diagnosed with type 2 diabetes were randomised to 6 years of structured personal care or routine care (ClinicalTrials.gov NCT01074762). The trial had 19 years of registry-based follow-up and was analysed with Cox regression models. Repeated occurrences in the same patient of outcomes (any diabetes-related endpoint, myocardial infarction [MI], stroke, peripheral vascular disease and microvascular disease) were accounted for with the Wei, Lin and Weissfeld method. As previously shown, the intervention reduced the rates of first occurrence of both MI and any diabetes-related endpoint. However, for all outcomes, the HR for a second event showed a statistically non-significant tendency to be increased. We estimated a combined HR for all marginal failure times, regardless of whether they were first, second or later events. 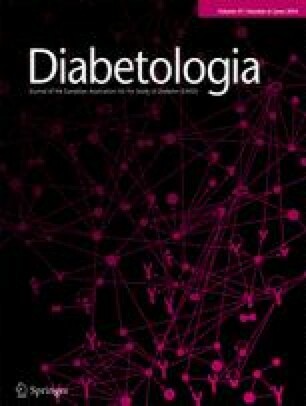 This showed that the intervention had no effect on the rate of any of the outcomes, including MI (HR 0.89, 95% CI 0.76, 1.05) and any diabetes-related endpoint (HR 0.98, 95% CI 0.87, 1.09). In the DCGP study, a smaller proportion of patients who received structured care experienced a first occurrence of MI or any diabetes-related endpoint compared with patients who received routine care. However, the patients who received structured care tended to experience more recurrent outcomes, so the total outcome rate was not affected by the intervention. The online version of this article (doi: 10.1007/s00125-014-3204-1) contains peer-reviewed but unedited supplementary material, which is available to authorised users. We thank the patients and general practitioners who volunteered to take part in this study. We acknowledge the assistance of Willy Karlslund, The Research Unit for General Practice, Copenhagen, Denmark. Funding of post-trial study: The Novo Nordisk Foundation, The Health Insurance Foundation, The Pharmacy Foundation, The A P Møller Foundation for the Advancement of Medical Science, Ernst Fischer’s Trust, The Danish Medical Research Council and The Danish Research Foundation for General Practice. Funding of the main trial: The Danish Medical Research Council, The Danish Research Foundation for General Practice, The Health Insurance Foundation, The Danish Ministry of Health, Novo Nordisk Farmaka Denmark Ltd, The Pharmacy Foundation, The Foundation for General Practice in Copenhagen, Frederiksberg, Tårnby and Dragør, The Doctor Sofus Carl Emil Friis and his Wife Olga Doris Friis Trust, The Danish Medical Association Research Fund, The Velux Foundation, The Rockwool Foundation, Novo Nordisk Ltd, The Danish Diabetes Association, Oda and Hans Svenningsen’s Fund, The A P Møller Foundation for the Advancement of Medical Science, The Novo Nordisk Foundation, Captain Axel Viggo Mørch and his Wife’s Trust, The Danish Eye Health Society, Mogens and Jenny Vissing’s Trust and Bernhard and Marie Klein’s Trust. The authors declare that they have no duality of interest associated with this manuscript. NDFO, HL and VS developed the research question for this study. VS performed the statistical analyses. NDFO was responsible for study design, randomisation, intervention delivery and data collection. All authors contributed to the analysis and interpretation of data. The paper was written by HL and NDFO with support from the other authors, and all authors revised the paper critically for important intellectual content. NDFO obtained funding. All authors have approved the version of the manuscript to be published. NDFO is the guarantor for this paper.